Patrolman Alfred Van Cleaf was killed when his motorcycle crashed while he was pursuing a vehicle. He was pursuing a vehicle when his motorcycle skid on wet pavement, causing it to crash near the corner of Richmond Turnpike and Bulls Hill Road. Patrolman Van Cleaf was assigned to the 63rd Precinct, the present day 122nd Precinct. 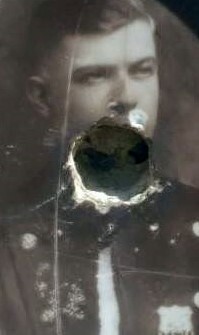 This is the only known photograph of him.